Ascocentrum orchids are beautiful Vanda relatives. They are generally considered miniature orchids, as they look a lot like Vandas, except smaller and brightly colored, with quite dense, erect flower stems. They are often hybridized with Vandas; the hybrids genus is called Ascocenda. Many species have attractive dark spotting on their leaves, which may darken when light intensity increases. 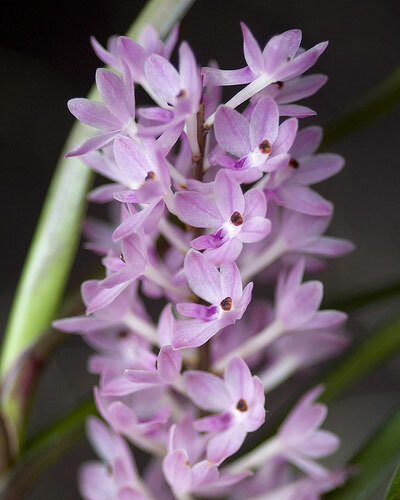 In this genus, you'll see a lot of vividly colored yellow, pink, and purple orchids. The flowers have a spur, or nectary. There are about a dozen species, all from various parts of Southeast Asia. The flowers have a short spur, or nectary, on the back of the lip to attract pollinators. They require high light, similar to Vandas or Cattleyas, at least 3000 footcandles. You may be able to gradually adapt them to direct sunlight. In the wild, they grow in deciduous trees, so they get more light during part of the year. It's not necessary to replicate this in cultivation, though. They like to be watered often (daily or more) and dry out quickly in between; use minimal potting mix to achieve this, as they like to be bare-root and get a lot of air to their roots. Of course, this means they need a lot of care and attention, unless you cheat and water them with a misting system on a timer! Grow them in a teak basket or net pot with no potting mix, or possibly a really coarse mix such as wine corks or coarse fir bark. Many people also grow them mounted on slabs of bark, which can be quite attractive. Good humidity is important; try for 70%. Temperature requirements vary somewhat, with some liking intermediate temperatures and others liking warm temperatures. Most will do best with daytime temperatures of 75-85°F (24-29C), cooling by 10-15°F (6-8C) at night. These plants are tricky for many to bloom, often because they don't have a place with enough light, or because the species in question needs warmer temperatures than they can provide, or because they aren't able to water often enough and so have to use a potting mix that dries too slowly. If you succeed with Vandas, you'll probably do well with these too.